Fort Collins, Colo., May 8, 2018 -- Ignite princess power with magically clear protection for your phone. OtterBox, the no. 1-most trusted brand in cell phone case protection, announces Symmetry Series Power of Princess collection. OtterBox Symmetry Series is available now with designs that will make Disney fans swoon. 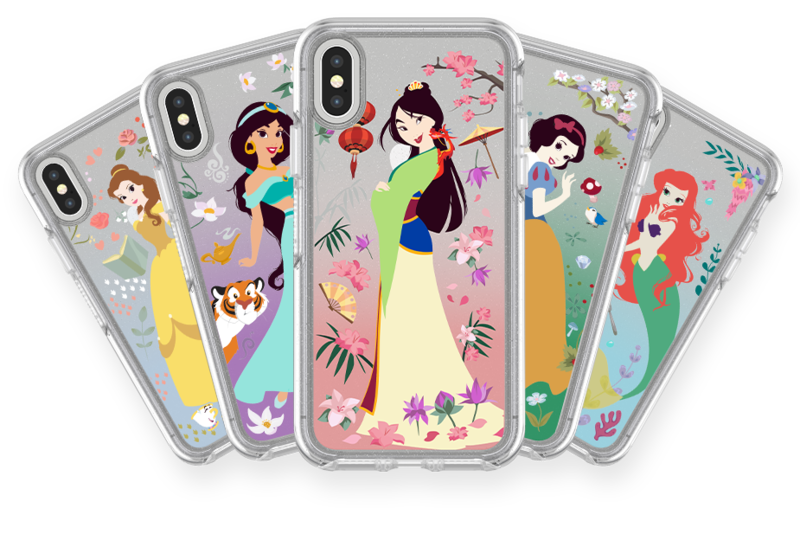 The sleek cases feature Ariel, Belle, Jasmine, Mulan, and Snow White.1 Each case design features the princess and her favorite things on a clear case with a hint of sparkle that blocks out drops and bumps. The Power of Princess collection highlights the unique qualities that make these princesses empowering and inspiring. Intelligent Belle overcomes obstacles with her knowhow. Adventurous Ariel is driven by her curiosity. Snow White’s kindness draws in people and animals alike. Independent Jasmine doesn’t let anyone hold her back from doing what’s right. Mulan brings her family honor through her incredible courage. The Symmetry Series features a sleek case that is powerfully protective against bumps and drops. The dual-density case slips easily in pockets while a raised beveled edge keeps the touchscreen tucked away from harm during drops. Symmetry Series Power of Princess collection cases are now available at otterbox.com for iPhone 8 and iPhone 7, $44.95; iPhone 8 Plus and iPhone 7 Plus, $54.95; and iPhone X, $44.95. For more information, visit otterbox.com. OtterBox is the "Official Protective Case" of Walt Disney World Resort and Disneyland Resort. Disney Parks, Experiences and Consumer Products is the business segment of The Walt Disney Company (NYSE:DIS) that brings the magic of Disney's stories, characters and franchises into the daily lives of families and fans around the world to create memories that last a lifetime. The company's iconic travel and leisure businesses include six resort destinations in the United States, Europe, and Asia; a top-rated cruise line; a luxurious family beach resort in Hawaii; a popular vacation ownership program; and an award-winning guided family adventure business. Disney's global consumer products operations include the world's leading licensing business; the world's largest children's print publisher; Disney Store locations around the world; and the shopDisney e-commerce platform. These experiences are created by Walt Disney Imagineering, the innovative force responsible for overseeing the segment's world-class products and experiences -- from immersive lands to interactive toys, and everything in between. 1 Symmetry Series is NOT protective against water. Will provide added protection against drops and shock. ©2018 Otter Products, LLC. All rights reserved. OtterBox and all OtterBox logos, trademarks and symbols are the property of Otter Products, LLC. All other logos, trademarks and symbols are the property of their respective owners.